This is possibly the only surviving Gold Seal Racing plastic Spitfire. 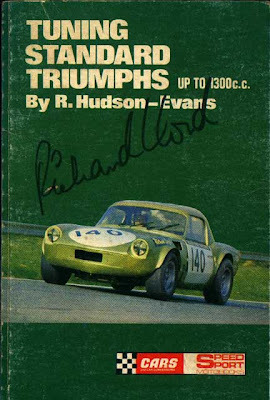 We were privileged to acquire this car from Richard Lloyd himself, who delivered the car to us aided by his race mechanic Peter Clarke (ex Triumph competition dept). Richard had tracked the car down with the help of Julius Thurgood classic car dealer (Julius has since informed us that he saw it in an advert in Exchange & Mart in 1984), and latterly the Top Hat race series organiser. Previous to this it had sat in a barn on a farm for many years in an unloved state. Unfortunately by the time we acquired the car it was engineless its original 70X engine having gone into a new car that Peter Clarke had built up for Richard to go racing in. They (Peter & Richard) having decided that it would be too difficult to enter an all plastic Spitfire in any established race series decided to build the new car up around a steel tub with aluminium outer panel-work (we supplied the tub and the alloy panels). As a result the glass-fibre car was now redundant and seemed unlikely to ever race again hence our acquisition. Earlier in it's history our car had been owned by Terry Hunter (former works rally driver for Triumph) who had bought the car directly from Triumph after its works competition career ended, he in turn passed it on to Peter Cox who then comprehensibly rebuilt it for Richard Lloyd into the plastic Spitfire we see today. 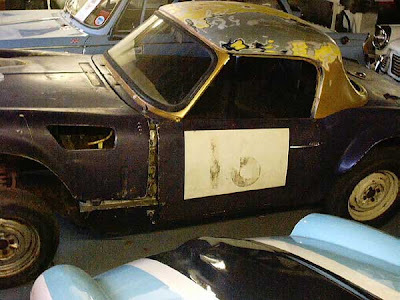 The only major steel part of the car, the bulkhead is probably all that is left of one of the original prototype Spitfires built by Triumph prior to production. Later in the cars racing career when it acquired it's blue nose. For those of you who were unaware of Team Gold Seal here is a brief history. 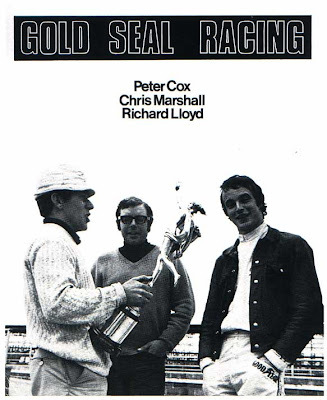 Gold Seal Car Company Limited (a London based sports car dealers) sponsored a team of 3 drivers and cars, the drivers being Peter Cox, Richard Lloyd, and Chris Marshall. Peter Cox needs little introduction as he was a prime mover in the factory competitions dept in the 1960s during the Spitfire racing/rallying years. Peter went on in 1967 to win the Freddy Dixon trophy in the ex Stirling Moss, Smart Spitfire ADU 467B. 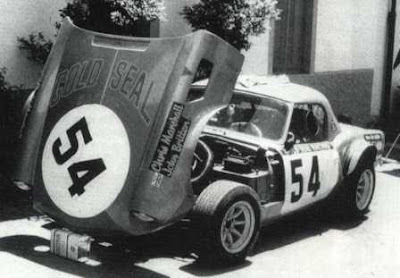 Indeed a highly modified ADU 467B was Peter's first Gold Seal sponsored car for the 1968 season. Richard Lloyd at the time was working for Peter Gormley Management Limited looking after Cliff Richard, The Shadows, and others, very 1960s! Richard went on to be a highly successful racing team manager including the Team Bentley Le Mans effort recently. Chris Marshall sold sports cars for a living, whilst in his free time he raced saloon cars (A40s, Minis, Anglias), until he converted to Spitfires. The cars themselves were radically modified Spitfire's even by today's standards. Eventually all three cars sported all plastic (glass-fibre) body-shells, bonnets, etc. Even the boot lids were 'glassed' in with integral glass-fibre hinges to complete the effect! The only 'metal' parts of the car ended up being the bulkhead and floors, yes even the sills were glass-fibre! All of this glass-fibre work was carried out by Chris Williams of Windmill Plastics here in Coventry, and indeed all of the cars carried Chris Williams sponsorship decals on their rear quarters. All three cars were built and maintained by Peter Cox, and Peter Clarke who was also a 'works' competition dept mechanic heavily involved in the Spitfire effort. All it needs is an engine, oh and a major restoration! 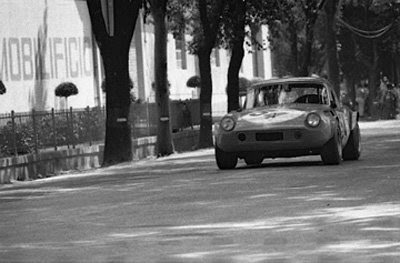 In 1969 Team Gold Seal entered two cars in the International Mugello Grand Prix for sports cars, run on the Mugello road circuit near Florence. Entered in the 1000cc class this entailed sleeving down the 1200cc 70X engines to 998cc. The two cars were entry number 54 (blue nose car), and entry number 55 (yellow nosed car). Unfortunately Pete Cox crashed the yellow nosed car very heavily in practice, so much so that all they brought of it away from the event afterwards was the engine (this engine subsequently got fitted to a Formula Junior style racer but was never very successful in this form), and a few other mechanical components. 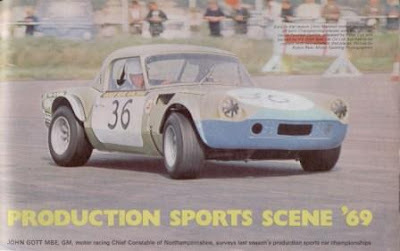 The blue nosed car raced in the event (driven by Chris Marshall & John Brittan) but suffered a puncture that put it out of the serious running. 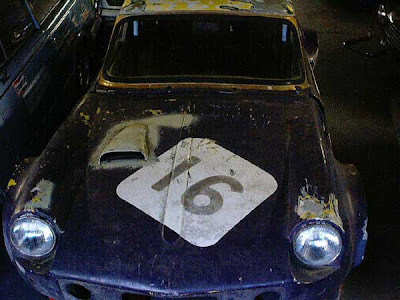 It was this car that Julius Thurgood tracked down and sold to Richard Lloyd years later, and that we were lucky enough to acquire later still from Richard. As it stands our car is in serious need of restoration, but it will be worth the effort, what a super part of Triumph racing history! The one stumbling block to an accurate restoration could have been sourcing a works 70X engine to replace the one removed by Peter in the course of building Richards new race car. However since we got the car we have found two genuine 70X motors, and enough components to build a third, so no problems there then. Now all we have to find is the time to do it.